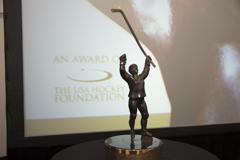 COLORADO SPRINGS, Colo. — The USA Hockey Foundation today announced the top-10 finalists for the 2019 Patty Kazmaier Memorial Award. The honor is bestowed annually upon the top player in NCAA Division I women's ice hockey, and this year will be unveiled at a brunch ceremony at Cascade Fine Catering in Hamden, Connecticut, on Saturday, March 23, as part of the NCAA Women's Frozen Four weekend hosted by Quinnipiac University. The three finalists, including the recipient of the 2019 Patty Kazmaier Memorial Award, will be chosen by a 13-person selection committee made up of NCAA Division I women's ice hockey coaches, representatives of print and broadcast media, an at-large member and representative of USA Hockey, the national governing body for the sport of ice hockey in the United States. The top-three finalists will be announced on Thursday, Feb. 28. 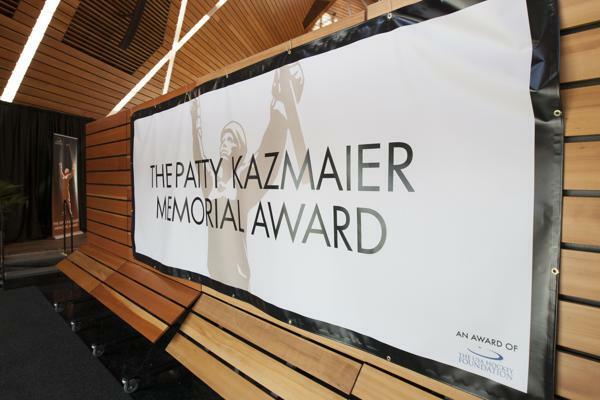 Tickets to the 2019 Patty Kazmaier Memorial Award Ceremony and Brunch can be purchased at PattyKaz.com. Individual seats to the event are $65, while tables of 10 are available for $600. A select number of sponsorships and program advertisements are also available. Notes: Nine schools are represented in the top-10, including two finalists for Clarkson University... Among the top-10 finalists are eight forwards, one defender and one goaltender, including six seniors, two sophomores and two freshmen ... ECAC Hockey leads all conferences with five finalists, while the Hockey East Association boasts three finalists and the Western Collegiate Hockey Association has two finalists. She is currently tied for the NCAA lead with program-record 38 assists … Ranks third in the NCAA and first in Hockey East with 55 points (17g, 38a) … Has recorded a point in an NCAA-high 28 different games … Also has 18 multi-point games, which ranks second in the country … Currently leads the nation with 30 points away from home, including an NCAA-best 20 assists … She is the country’s current leader with 24 primary assists … Has recorded an assist in an NCAA-high 27 different games … She enters the final weekend of the regular season on a 13-game point streak … Has factored on eight of the Terriers’ 18 game-winning goals … With one more goal, she will have doubled her goal, assist and point totals from her rookie year last season … Is a plus-36, which is tied for first among all Hockey East skaters ... Has a 2.53 GPA while majoring in General Liberal Arts and Sciences. Leads team in goals (25) and points (45) through 32 games ... Ranks seventh in the NCAA with 45 points ... Second in the NCAA with 25 goals ... Has factored into 40% of the team’s scoring this year ... Broke the all-time school record for goals in a season ... Broke the all-time school record for career points. Currently at 154 points ... Broke the all-time school record for game-winning goals (16) ... Tied for fourth in the NCAA with five game-winning goals ... Tied for the program record for points in a season with 45, which she set last season ... Tied for the program record for career shorthanded goals with nine. She has three this season, which ties her for second in the NCAA ... Broke the all-time school record for career assists last weekend with her 85th ... Holds or shares eight program records ... Named the ECAC Hockey Player of the Month for December ... Named the ECAC Hockey Player of the Week in December ... Team tri-captain ... First Top-10 Patty Kazmaier Finalist in Colgate history ... Has a 3.33 GPA while majoring in Educational Studies and Psychology. The nation’s top scorer (2.04 points per game), top freshman scorer and leads the nation in assists per game (1.35) … seventh in Division I in goals per game (0.70) … Leads the Tigers in scoring with 47 points on 16 goals and 31 assists … missed four games to compete for Hockey Canada at the Four Nations Cup … Hockey Commissioner’s Association Rookie of the Month in December and January … ECAC Hockey Rookie of the Month in December and January … ECAC Hockey Player of the Week (Jan. 7) … ECAC Hockey Rookie of the Week (Dec. 3, Jan. 7) … NCAA First Star of the Week (Jan. 8) … Six-game goal-scoring streak of nine points and a nine-game point scoring streak totaling 23 points … First Princeton skater to have a five-point game since 2006 and has 16 games with at least two or more points … Won more than 250 face offs and has blocked 16 shots … Helped Princeton to its highest ranking in program history, an Ivy League title, and an 20-game unbeaten streak the longest in the nation this year and the longest in program history … Volunteered with team initiatives including Sunday Nights Skills, Trick or Trunk, Headway, Ed Snider Youth Hockey Foundation as well as individual efforts with North Halton Twisters and CXT … Has a 2.80 GPA and intends to major in either Economics or Psychology. NCAA’s leading goal scorer with 33 and tied with linemate Elizabeth Giguere for most points in Division I with 59 through 30 games … Ranks first in the NCAA in game-winning goals (9) and hat tricks (3) ... Has recorded at least one point in 26 of 30 games, including 17 multiple-point outings … Leads NCAA in shots on goal per game (7.50) … Posts nation’s third best plus/minus (+41) … Clarkson’s all-time leading scorer with 203 points, including school-record 109 goals through 152 career games … Named Women’s Hockey Commissioner’s Association National Player of the Month on two occasions (October, January) ... Named ECAC Hockey Player of the Month on two occasions (October, January) ... Named ECAC Hockey Player of the Week on three occasions (Oct. 22, Nov. 26, Jan. 28) ... Named NCAA First Star of the Week (Jan. 29) ... Named NCAA Second Star of the Week on three occasions (Oct. 23, Nov. 27, Jan. 22) ... Named NCAA Third Star of the Week (Feb. 5) ... Volunteers at Potsdam Elementary School ... Participates in Smart Cookies Enriched Program, Clarkson Women’s Hockey Lil’ Knights Club and Active Souls Project with Special Olympics ... Volunteered with Sick Kids Hospital in Toronto and participates annually in Skate with a Knight, as well as Potsdam Community Outreach Clean-Up ... Has a 2.91 GPA while majoring in Communications. Currently tied with linemate and fellow top-10 honoree Loren Gabel for most points in NCAA (59) and tied as Division I’s leading playmaker with 38 assists in 32 games … Owns the best plus/minus (+51) in the nation … Ranks first in the NCAA in shorthanded goals with five ... Has recorded at least one point in 27 of 32 games, including 20 multi-point outings … Named ECAC Hockey Player of the Month (November) … Fastest player to reach 100 points in Clarkson women’s hockey history (beat existing record by 31 games) ... Volunteers at Potsdam Elementary School and Colton-Pierrepont Central School ... Volunteers at Smart Cookies Enriched Program, Clarkson Women’s Hockey Lil’ Knights Club and Clarkson Youth Hockey Clinics ... Volunteered at a Holiday Food Drive and participates annually in the Skate with a Knight program and Potsdam Community Outreach Clean-Up ... Has a 2.81 GPA while majoring in Business Studies. Ranked first in the country among blueliners in points (41), goals (18), assists (23), goals per game (0.56), points per game (1.28) and game-winning goals (5) and is tied for first in power-play goals (6) ... The captain has 113 shots on goal and is averaging 3.53 shots on goal per game, with both of those numbers ranking third among blueliners ... Among all skaters in the country, ranks in the top 15 in points (t-10th), goals (t-12th), assists (t-13th), power-play points (t-12th), game-winning goals (t-4th), points per game (t-13th) and plus/minus (t-5th) ... Her plus-36 is tied for fifth in the NCAA and is second among defensemen ... She has been on the ice for 55% of BC’s even-strength goals ... She has registered at least one point in 26 of her 32 games played (11 multi-point games) ... Set the Hockey East single-season points and goals record for a defender with 37 points and 16 goals ... Holds the conference career and single-season points, goals and assists records by a defender and is second all-time in career assists with 80 ... Her 16-21-37 scoring line in Hockey East play is good for a tie for second overall while her plus-35 rating leads the conference ... Volunteered with Newton Special Athletes, Perkins School for the Blind, the Boston College Campus School, East Coat Jumbos (American Special Hockey) and Food for Families ... Has a 3.23 GPA while majoring in Communications. Leads all Hockey East rookies in goals (16), assists (27), points (43), power-play points (13), game-winning goals (5), plus/minus (+25), shots on goal (110) and faceoff wins (310) ... Five game-winning goals are tied for fourth-most nationally ... Nationally, ranks ninth in points, sixth in assists, seventh in power-play points and fourth in game-winning goals ... Points in 27 of 31 games this season, including at least a point in all 10 games against top-10 opponents (4 goals, 10 assists) ... Registered 22-game point streak (Oct. 6 – Jan. 19), the longest in the NCAA this season and third-longest in Hockey East history ... 3-time Pro Ambitions Rookie of the Month in Hockey East (October, November, January) ... Commissioners Association (WHCA) National Rookie of the Month (October) ... 4-time Pro Ambitions Rookie of the Week in Hockey East (Nov. 5, Nov. 12, Jan. 7, Feb. 11) ... Hockey East Player of the Week (Nov. 6) ... Has a 3.636 GPA and is undecided on a major. She has recorded 37 points (17G, 30A) in 30 games this season and her 1.23 PPG ranks 19th in the NCAA ... Named WCHA Forward of the Week on two occasions (Nov. 26, Dec. 10) ... Named WCHA Forward of the Month (Dec.) ... She had a seven-game goal streak this season, the third-longest goal streak in program history … Currently ranks fifth in plus/minus (+141), sixth in points (193) and goals (85) and seventh in assists (108) in school history … Named a Hockey Humanitarian Award Finalist ... Recipient of the 2016 NCAA Elite 90 Award … Has volunteered more than 2000 hours with Occupaws, where she helps raise guide dogs ... Volunteers at the UW Children’s Hospital … A three-time WCHA Scholar-Athlete, she holds a 3.789 GPA while majoring in Zoology. Has recorded a career-high 41 points (12G, 29A) in 32 games this season ... Ranks fifth in the NCAA in assists and tied for 10th in points ... Has a team-best 12 multi-point games ... Has a team-best six multi-assist games ... Leads the WCHA in points and assists ... Scored game-winning goals in 3-1 win over then No. 1 Wisconsin (Jan. 19) and 5-3 win over Minnesota Duluth (Feb. 3) … Completed an internship at Os Hockey ... Currently completing an internship at JK Medical ... Has recorded over 60 hours of community service ... Has volunteered with local youth hockey associations, along with the Girls Hockey Outdoor Classic, Herb Brooks Foundation, and Hockey Limited ... Has volunteered with non-profit organizations Doing Good Together and Loaves and Fishes ... Has participated in the University of Minnesota and HopeKids annual Hope Day Festival ... Has taken part in other Gopher Athletics volunteer opportunities through the Golden Gopher Fund and Gopher International ... Completed her undergraduate degree with a 3.951 GPA while studying Business and Marketing Education and has a 3.633 GPA in her graduate program for her Masters of Education in Sport Management. Ranks first among NCAA goaltenders in save percentage (.945) and total saves (1,012) ... Seventh in ECAC Hockey in goals against average (2.07) and winning percentage (.466) ... 11-13-5 overall record, including 8-9-1 mark in ECAC Hockey play ... Three shutouts (all 1-0 wins, including 58-save game at Robert Morris on October 12) ... Has recorded 30+ saves 20 times ... 40+ saves 10 times ... 50+ saves three times ... NCAA All-Time Saves Leader (3,947) ... NCAA First Star (October 18) ... NCAA Third Star (January 29) ... ECAC Hockey Goaltender of the Month (October) ... Two-time ECAC Hockey Goaltender of the Week ... Named to the preseason All-ECAC Hockey Team ... Captain ... Raised money for Making Strides against Breast Cancer in Albany ... Volunteer for Special Olympics (on campus) ... Assisted in Learn to Skate Programs in Albany and Troy ... Member of RPI Student Athlete Advisory Council (Not So Scary Kids Halloween and the SAAC Blood Drive in February) ... Has a 3.39 GPA while majoring in Chemical Engineering.